As an example, my five-year-old daughter really wants to mow the yard. She watches her older siblings do it, and she thinks she can do it. Her heart is in the right place, but she does not have the knowledge and strength to do the job. Her older brothers, on the other hand, still like to mow, and they have the knowledge and strength to do it. When I hear about them mowing the lawn, I do not cringe in fear for their safety or whether the job will be done right. So, I trust them. When I think about the possibility of my five-year-old daughter mowing the yard, I certainly have negative thoughts and simply don't trust her. Trust has two components: character and competence. The contrast between my children and their lawn mowing abilities touches on both components. Full trust cannot be given unless a person possesses both of these. To trust, I need to know that the person has the integrity to do what they say they will do AND that they are capable of producing the desired results. As you can see, I'm not there (yet) with my daughter. 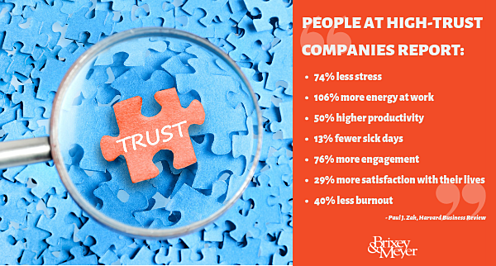 "Trust is a key ingredient in all positive human relationships… including the workplace." Enough research has been done to assign a direct relationship between trusting workplaces and positive outcomes. In the January-February issue of the Harvard Business Review, Paul J. Zak wrote an article entitled “The Neuroscience of Trust.” He stated the following: “Compared with people at low-trust companies, people at high-trust companies report: 74% less stress, 106% more energy at work, 50% higher productivity, 13% fewer sick days, 76% more engagement, 29% more satisfaction with their lives, 40% less burnout.” This should not be shocking as trust is a core trait of what it means to have positive human relationships. When there is trust, empowerment arises. When there is trust, innovation flourishes. When there is trust, teamwork shines. Creating a workplace filled with trust should be every leader’s aim as the positive outcomes desired (e.g.—increased margins, lower turnover, increased innovations, decreased time to market) will follow. "Trusting workplaces start with leaders, who exhibit both character and competence." They are people, who do what they say and have worthwhile intentions. They are people, who have the capability to do the job and a proven track record of results. Leading from a vantage point of trust creates an organization filled with bigger, better, faster, and stronger results. For this to happen, trust must be a key component in the very fabric of the organization. For some organizations, this is already a reality, and they must continue to reinforce this value. For other organizations, trust is lacking. What can they do? They must start with a new mindset that building trust will be as great a priority as meeting other company benchmarks. Keep your word. If you say you will do something, do it, or explain in advance why you need to take a different course of action. Share the realities of what is going on. If the organization is struggling, be the first to let the team know. When a leader admits to difficult times, it shows the team that s/he will be open and honest. Deliver both good and bad news directly. Most people struggle with ambiguity. When they do not know what is taking place in an organization, they create their own reality. When a leader is transparent, fear lessens and many times, the entire organizations rallies around a common opportunity or threat. Practice positive gossip. Positive gossip is saying nice things about others behind their back. Be known as someone, who only speaks positively about people not in the room. Be vulnerable. Let your team know when you make a mistake and let them know what you learned from it and/or plan to do in the future to correct it. Work Hard. Nothing can replace hard work. People, who talk about results and demonstrate the willingness to obtain them gain trust and credibility. Give Trust. Empower team-members to do great things without micro-managing them or abandoning them as they learn. When a person feels trusted to learn, grow, and perform, they typically produce superior results in the long-run. Organizations that have trust as a cornerstone of their culture will outperform organizations with a lack of trust. It may not be seen immediately, but it will surface in the long-run.